BAM! Restaurant, breaks free from the constraints of East and West. I have an interest in how sake culture evolved in Singapore. This time I encountered to the summit to answer my question. 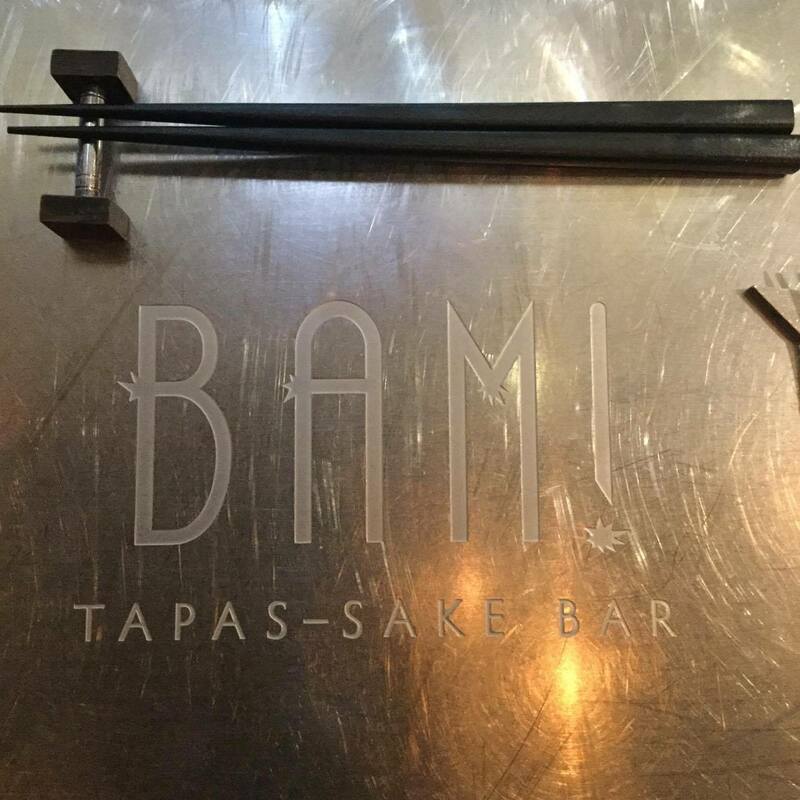 Name of the restaurant is BAM! Restaurant.The Interior of the restaurant is a refurbishment of an old shop house turned into a modern industrial design. 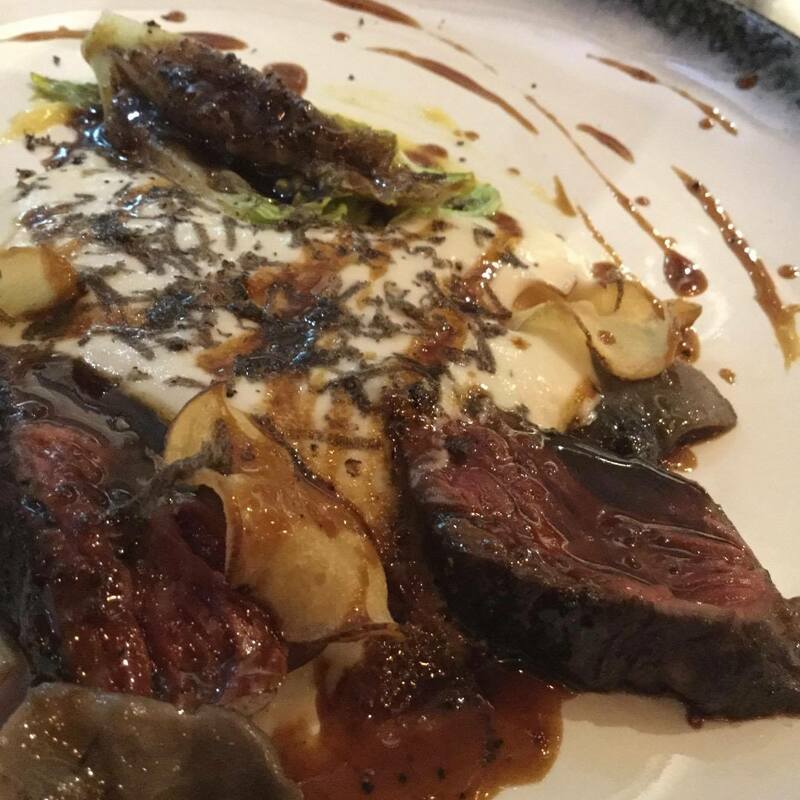 Cuisine is described by the Chef Pepe from Barcelona, ͞innovative cuisine͟, with a hint of Catalan and Japanese food. And of course the alcohol to go with these innovative cuisines is sake. 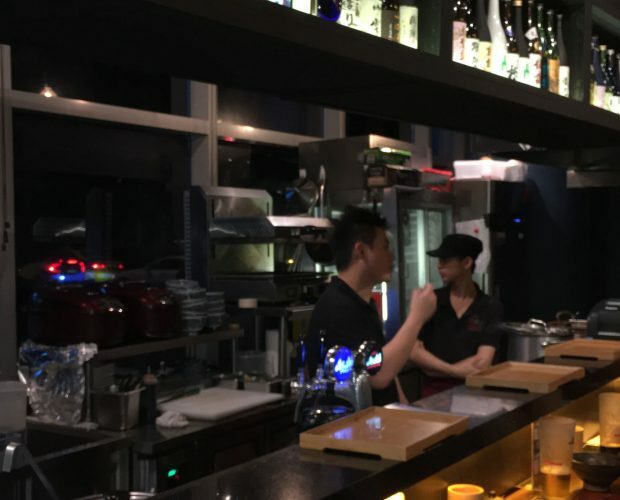 The Chef said that Singapore enables him to obtain various ingredients from Europe to Japan, and to make dishes go beyond the framework of East and West. Reflecting Pepe’s passion, there is a sophisticated yet vibrant and casual atmosphere in his restaurant. 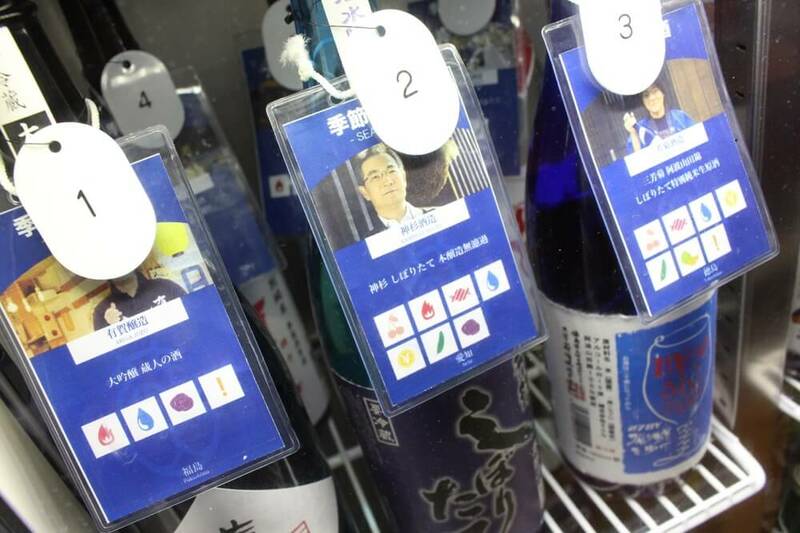 You maybe say it is difficult to select the one you want to drink by yourself. With regard to that point, you don’t need to worry about. They prepare the instruction which enables customers easy to understand the feature of each sake. The taste is simply described by using 11 icons as follows. That instruction will help you definitely. This time, I had chef’s Omakase course with Sake pairing. Aperitif was champagne Philippe Gonet brut, and Sake, Minamogawa from Ibaraki. Amuse bouche was a fried oyster with caviar and monkfish liver sauce. Champagne has plum like aroma with sour taste goes well with umami of oyster, and perilla taste. 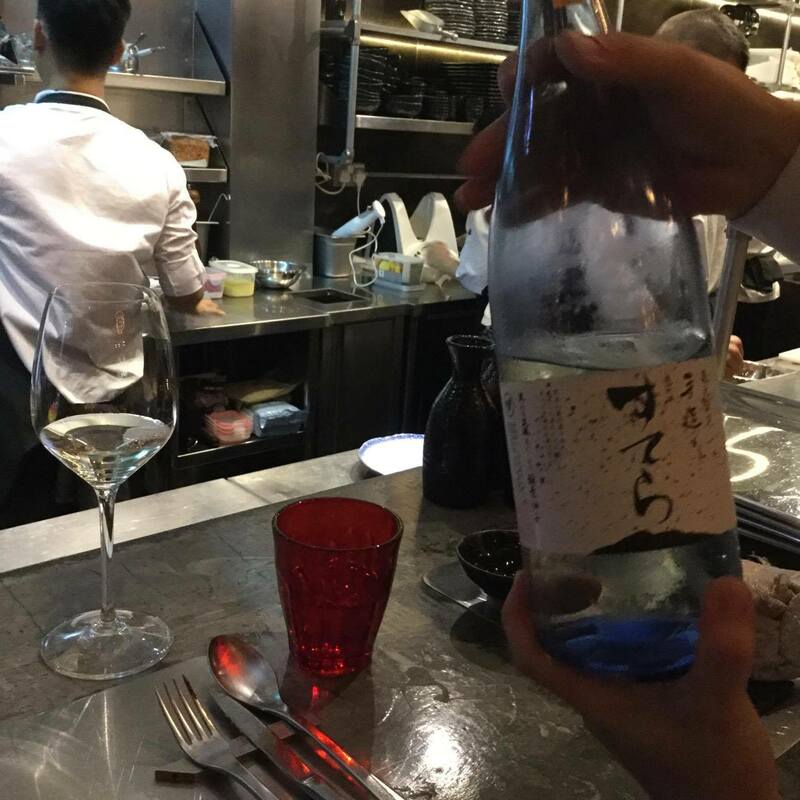 Sake has apricot like aroma with melon like sweetness, goes well with umami absorbed in a soft skin of fried oyster and its taste expands in horizontal direction. Appetizer was a deep water shrimps, sea urchin and Spanish pea with Ponzu vinegar jelly. First there was a taste of sour Ponzu, then sour cream, perilla, sweetness of sea urchin, sesame, each taste come and goes. 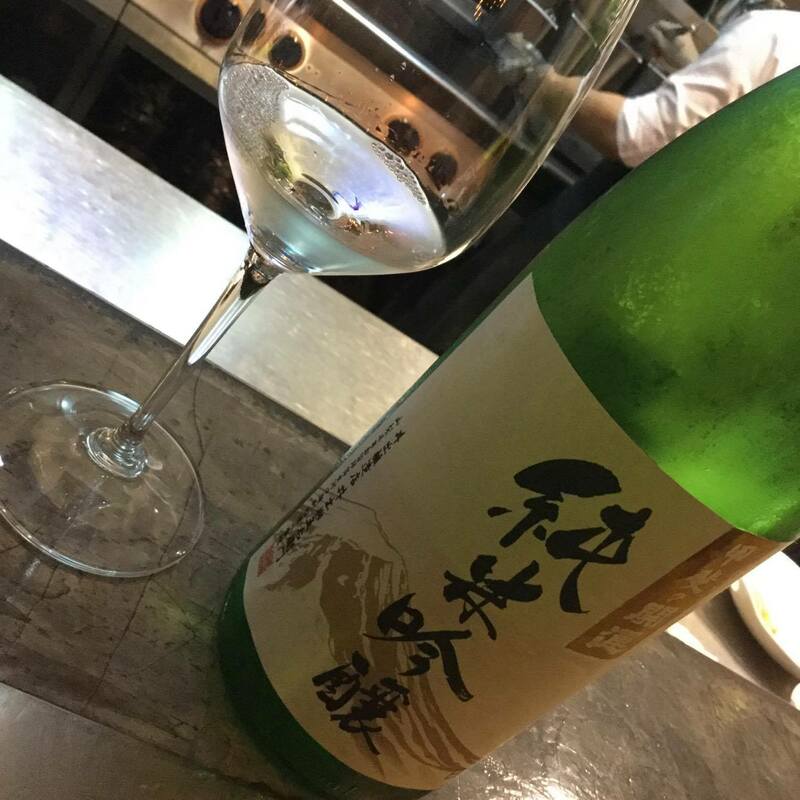 Sake was Ura-gasanryu from Yamagata prefecture. It has an aroma of pear, delicate and round bittersweet taste. Together with appetizer, they blend well especially with sour cream and this mixed taste run through the center of tongue. 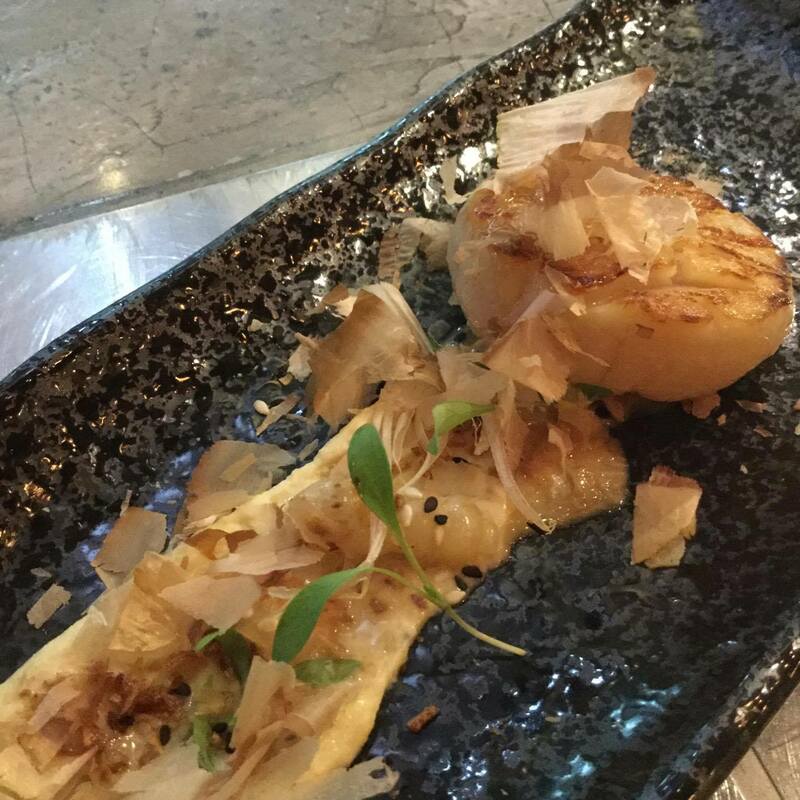 Next dish was scallop grill with humus paste, Japanese ginger, fish bonito, and sesami. Sake was from Niigata, Hakkaisan Jozoshu. Sake has caramel like aroma then sweet taste expands horizontally. Sake blend well with bitter-sweetness and sourness in Japanese ginger and humus, and let rich umami of scallop stand out well. This plate has beautifully arranged asparagus, salmon roe, mashed potato, pine seeds, and sake mousse. 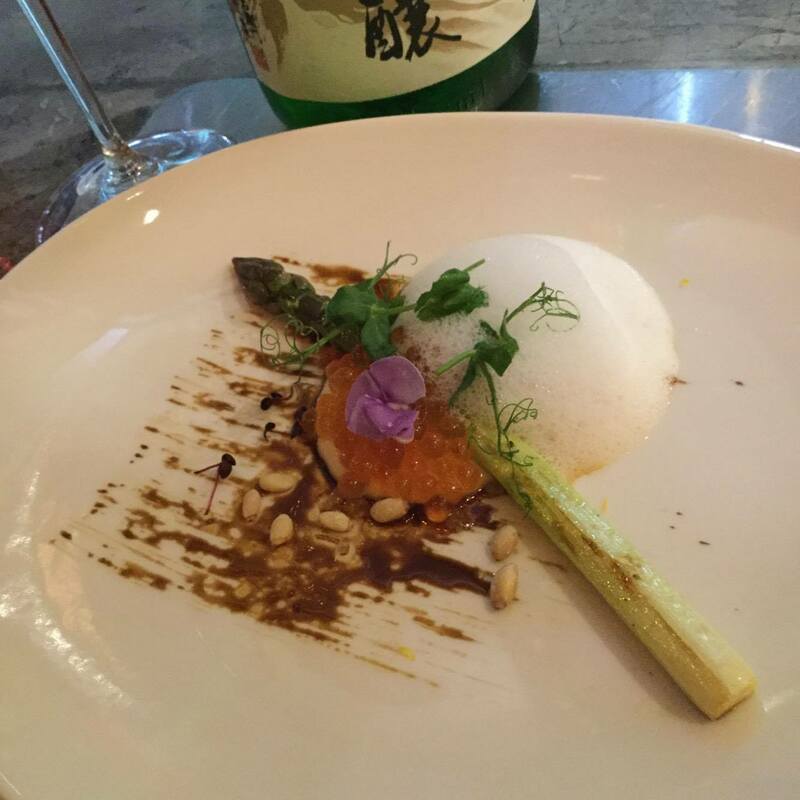 First there was a sweet vinegar taste, then salmon roe and mashed potato flavor wrapped softly in sake mousse, and lastly spring taste of asparagus blooms. 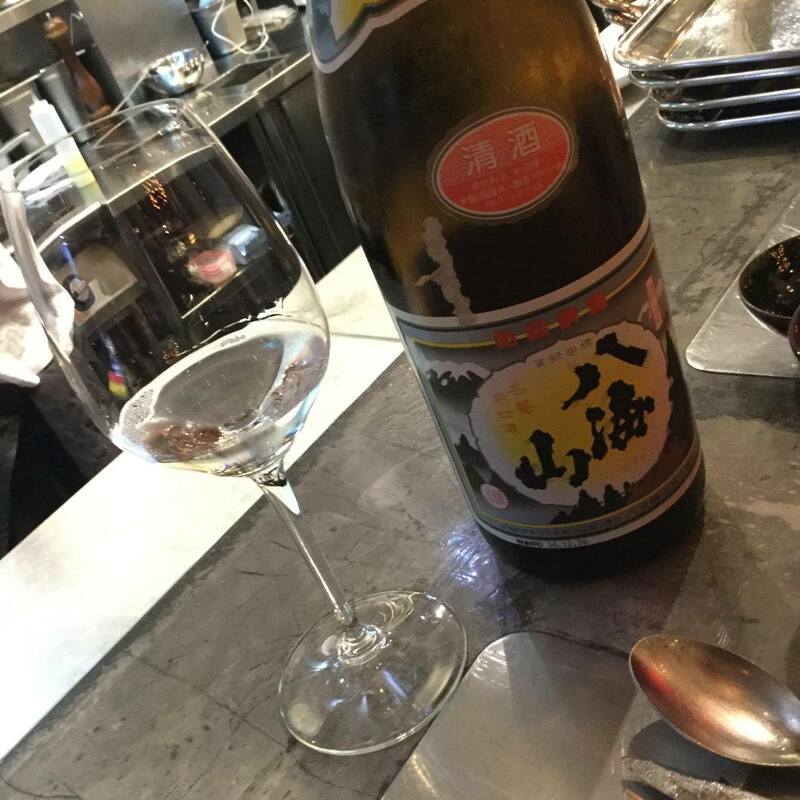 Sake was from Yamanashi prefecture, Kai no Kaiun. 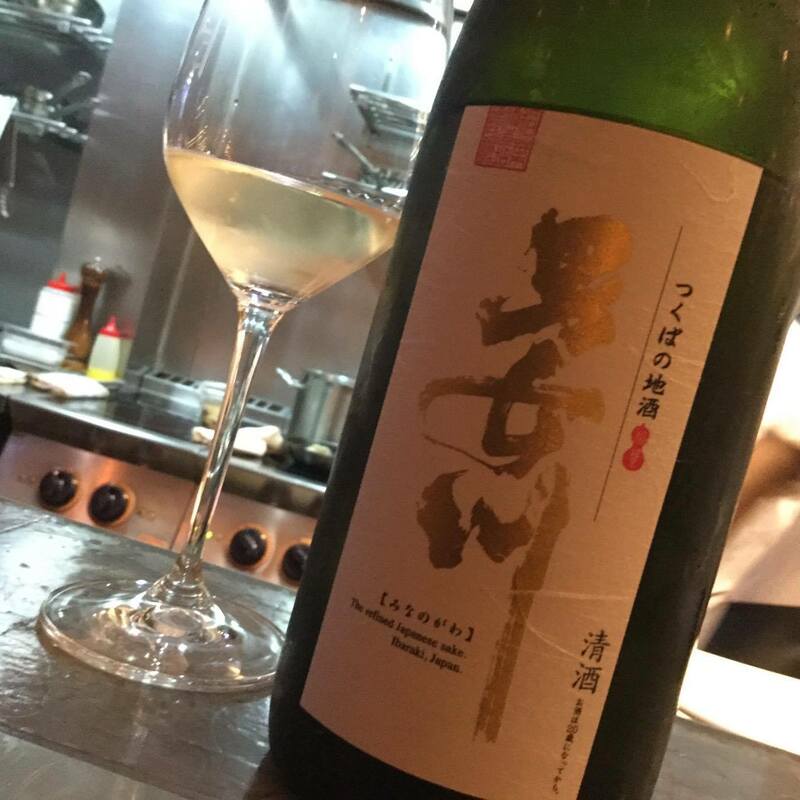 It has sweet and sour aroma, Muscat like umami and sweetness burst in mouth. Sourness of sake and dish match well, and their bitter sweetness stands out. 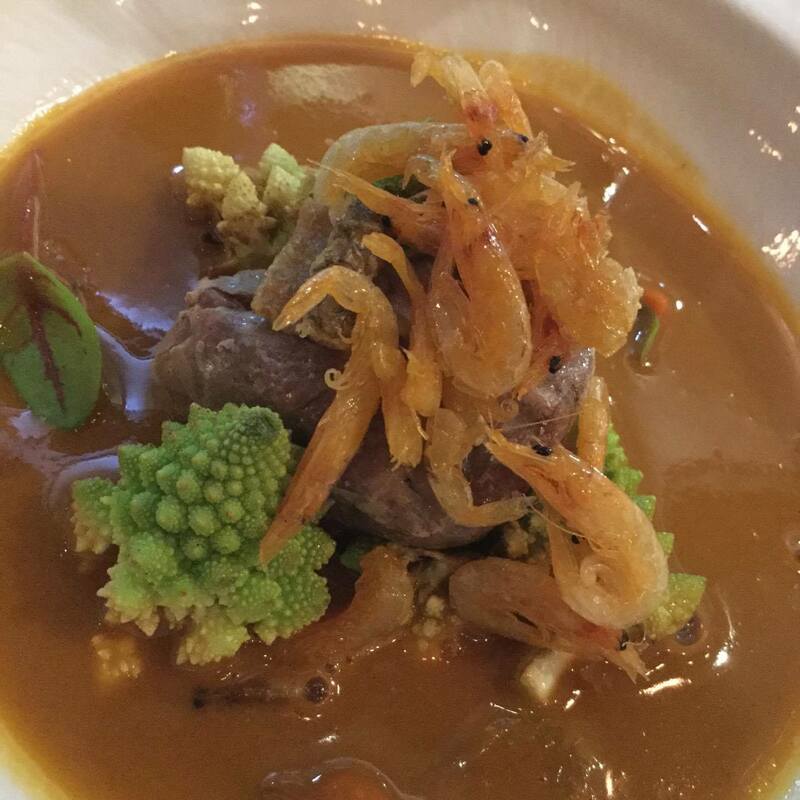 Following dish was, well grilled Tuna head meat, Romanesco broccoli, Sakura shrimp with lobster sauce. Creamy and fruity rich lobster sauce, and nicely grilled tuna, flavor of shrimp blend well with gentle taste of the broccoli. 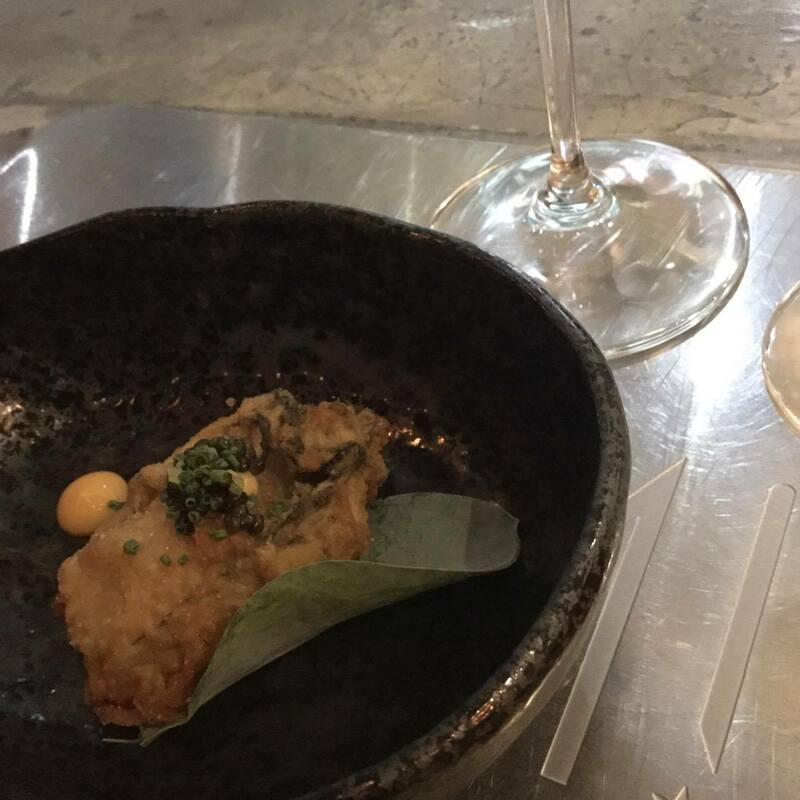 Minamogawa non filtered Junmai Daiginjo ͞Stella͟ paired with this dish. Sake has slight elegant sweet aroma, vanilla like bittersweet taste. Sweetness in Sake fit well with Sake and this let ingredients flavor dance. 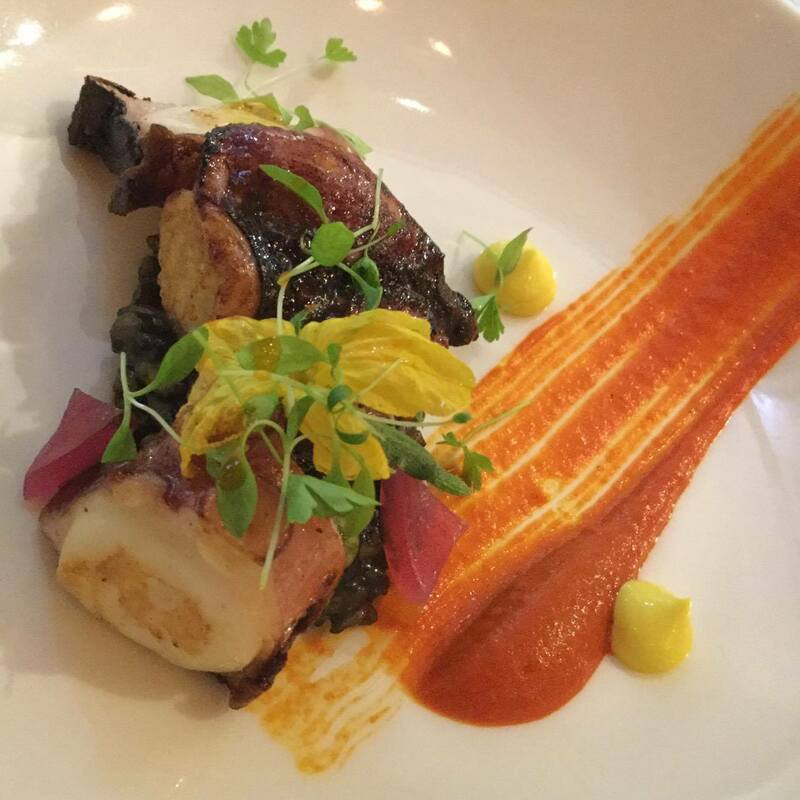 Highlight of the course was, Grilled Spanish octopus, and Japanese squid ink risotto with Chef Pepe’s original sauce and mayonnaise lemon sauce. The plate arranged as if reflecting Pepe’s passion, there is a bright color composition with elegance. Chewy octopus with profound umami, lightly chilly tomato based sauce, rice texture and edamame umami in risotto, sweet and sour lemon sauce… I got so excited what would happen when this dish paired with Sake. 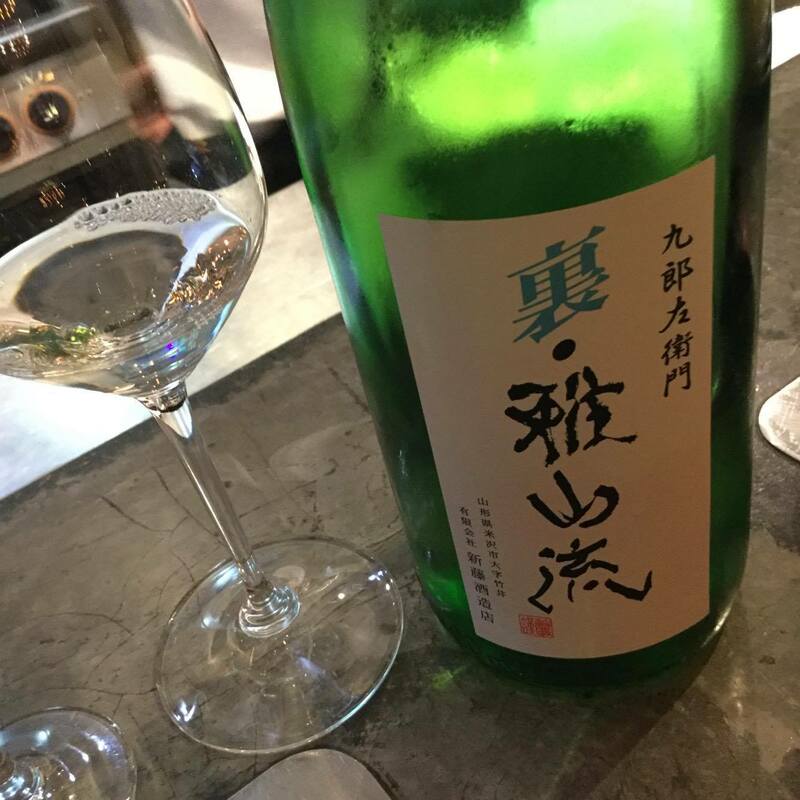 Minamogawa Junmai Daiginjo Funeshibori has bland aroma, rich pear and vanilla like bittersweet flavor. With this plate, just like the moment football player makes a goal, fantastic bitter-sweetness stimulates mouth and sake taste run straight through my tongue. Main dish was beef steak with miso hollandaise sauce. Sake was from Hyogo, Kijuro, Kuromatsu Hakushika special Honkozo with sweet ester aroma, and profound bitter sweet taste. Sweet sour sauce goes with tender meat, goes well with acid taste of sake and then a shiitake like flavor comes out. 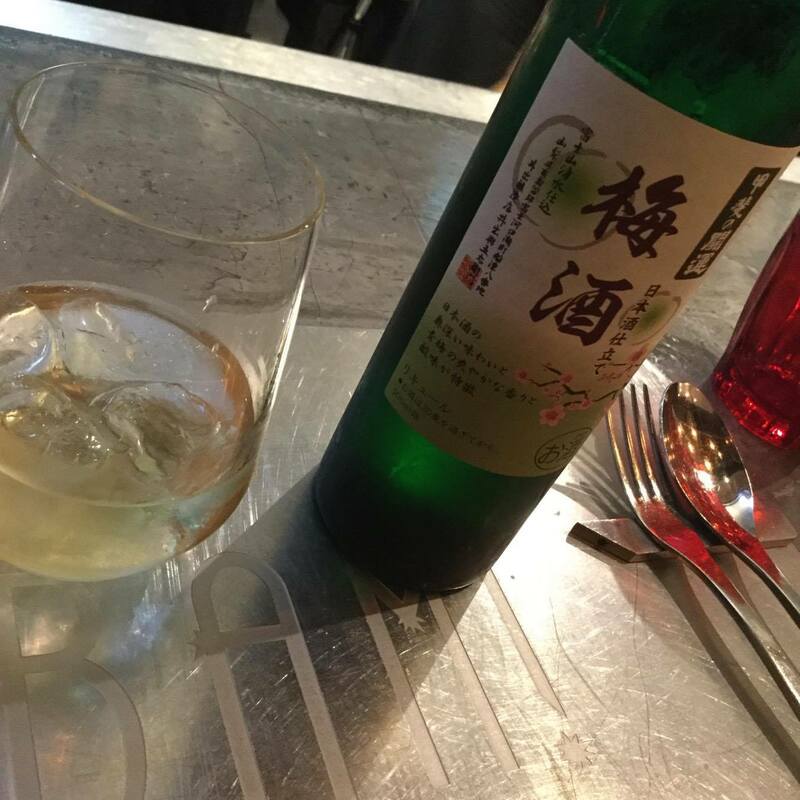 For a dessert, I had plum sake ͞Umeshu͟ of Kai no Kaiun. It has strong sour taste. Spanish baileys, lemon mousse, and sherbet blend sourness of sake well and later a slight sweetness emerges. 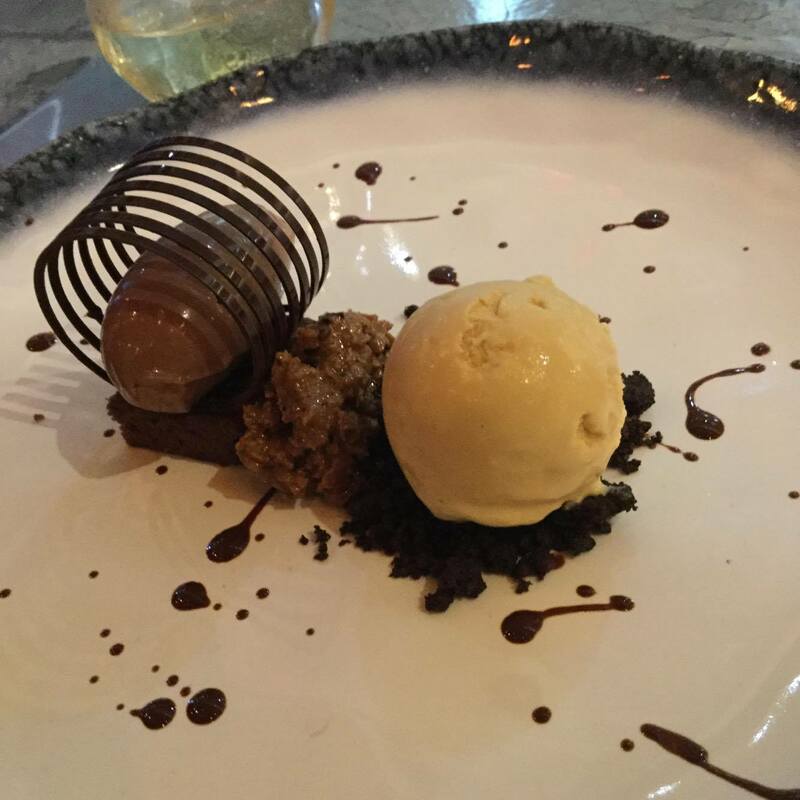 Lastly, I had a beautifully decorated caramel ice cream that both sourness of sake and chocolate matched well. 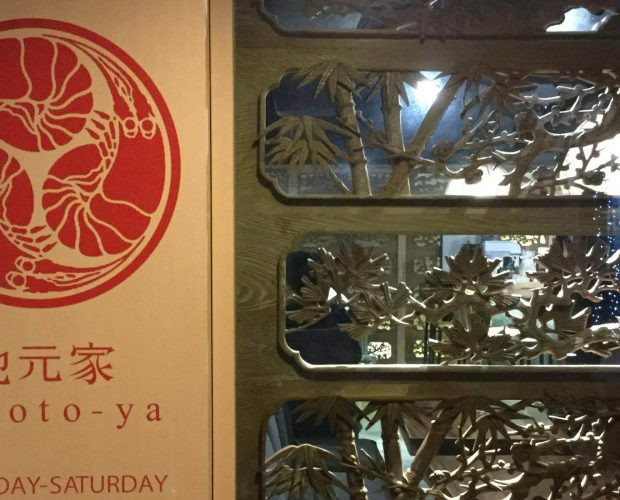 This restaurant breaks free from the constraints of East and West. Freely yet elegantly arranged dishes and carefully selected sake entertain your coordinate of taste, while the rest of senses stimulated through color, aroma, and texture. I have a feeling that this kind of exploration could only happen in a platform like Singapore. It was the experience I have been looking for since I started writing about novel sake culture in Singapore. 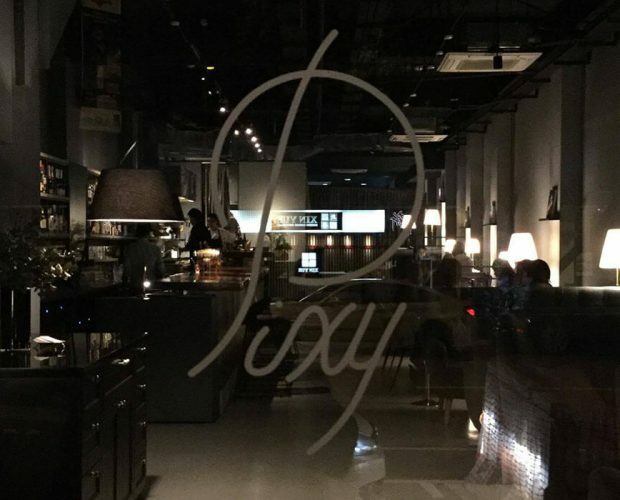 If you are interested in food in general, which means this is a must go place. 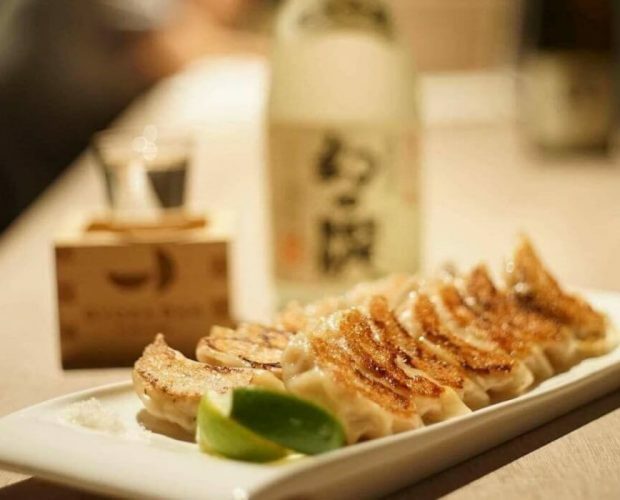 Gyoza bar – bar look like the one in Haruki Murakami’s novel.